Now you might wonder *why* I would spend so much time on this – right? Well, partially because I was forced to endure this lame version by Miller Lite every day in December -UGH!! I finally snapped after the 100th time of having to watch this thing and got to work. Now, the guys over at Swift3D came out with Papervision3D support and I wanted to do a project with Swift to see where the holes were and what it was really capable of doing. I’m here to say Swift3D is the real deal – it has powerful tools you’d never expect, and it gives you a ton of export/rendering options that every Flasher out there needs when doing 3D/2D work. 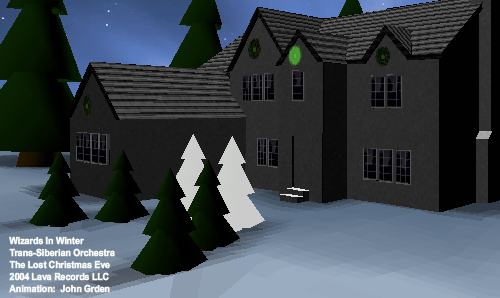 So, with the exception of baking in shadows on the house’s texture, the entire scene was modeled in Swift3D. The trees were all created with the lathe tool (which freakin’ rocks for stuff like this) and the star was a simple extrusion. 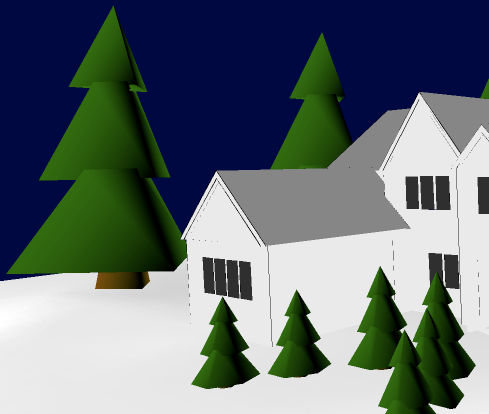 The house, oddly enough, was from Google’s online library of free Sketchup models. I was able to convert it to 3DS and Swift3D imported it right into the scene. How cool is that?!?! I then sat down to write out an animation engine I’d been meaning to try for a while. Basically, I created “Sequence Groups”, and played their “parts” on the computer keyboard with the music. When I was done with the particular section, I would dump an array out of the recorder, paste it into my code for the particular SequenceGroup and bam, the engine took care of the rest. I was seriously surprised at the accuracy I was able to get with this method – I was able to play 16th notes wiithout it dropping a single note and in my testing (even though this song doesn’t have any) 32nd notes worked at this tempo as well. I really pushed to get this done for this weekends class in San Francisco – it turned out to be one of the coolest teaching tools I could have ever imagined. It’s got tons of tricks and optimization techniques as well as demo’s on communicating with your Papervision3D scene’s, materials and DisplayObject3D’s. So for all of you making it to the class, you’ll have the full source given to you and we’ll be covering how it was done and dig in with some hands on examples. I’ll be posting the code for this project after the San Francisco class next week sometime. I might add that the 9.0.115 player really gives this a boost. Usually in the mid 20’s with the FPS, and in the high teen’s with the Flash IDE player. Hahaha, coooool! 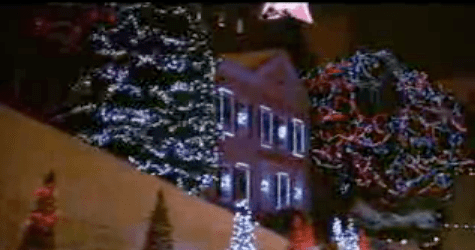 I blogged about the original video Christmas 2005. So they are using that in an ad now? Need any benchmarks? The SWF runs fine on a recent Mac. You are a marketing genius! ROCK! I really enjoyed it John! Really well done! That is Über freakin awesome. This is the kind of thing where the 3d is just a part of an overall brilliant idea! You rock john! Oh, so the gauntlet has been thrown then. And as a developer at Miller Lite’s digital agency, I feel I must respond. We have your framework. We deployed a project using it last year. We will do more in the future. It will be better than whatever this thing is. Beware the long arm of digital marketing. We are everywhere and we know AS3. @vyper: YES! that’s the plan! Great class John. And yes, it was cool to go through the source to Winter Wonder Land, especially the part about optimization tricks to get the FPS rate up. I’m going through all the code today and trying to digest the info-dump. you must be a flash guy. nice work, john. glad to see freelancing isn’t keeping you so busy you can’t find time to just f*ck around. Just awesome, great idea, cool flash adaptation and perfectly executed. Once again proving, you are the man! very cool, good editing to. As always you are kicking some major assage. Hey there, really inspiring!! You mentioned posting the code/assets for this piece after the SF trip, which appears to have been a while ago. Any chance you’ll still be posting? Thanks either way!